We all prepare our Indian traditional recipe Onion Poha or potato poha. I tried this different innovative recipe & it turned out soo tasty. Pl do try this really healthier version as it contains lots of veggies. 1. Soak Poha in enough water. 2. Add oil in a heavy bottom vessel or in a kadhai. 3. Add cumin seeds & chopped green chillies in the oil. 4. Add 2 tsp Schezwan chutney in the oil. 5. Roast for some time. You will experience yummy spicy aroma. 6. 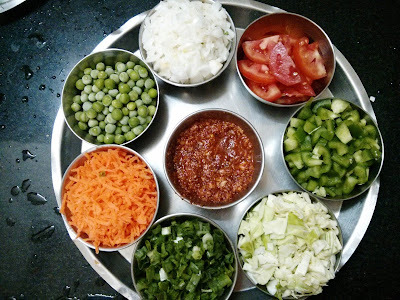 Add white onion, cabbage, capsicum, carrot, green peas , tomato one by one. 7. Mix all the ingredients properly. Do not overcook veggies. They should be half cooked. 8. Add 1 cup green onion & soaked poha in the veggis. 7. Preserve 1/2 cup green onion for decoration. 9. Turn off the flame when proper mixing is done. 10. Decorate with lemon slice & green onion. 11. Sprinkle Coriander leaves if you want. 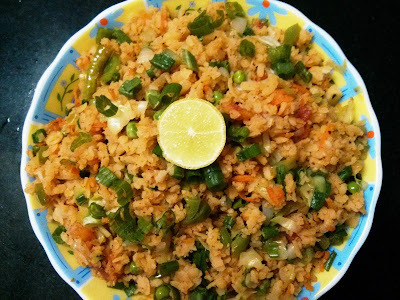 12.Serve hot this mouth watering recipe !! !